3. 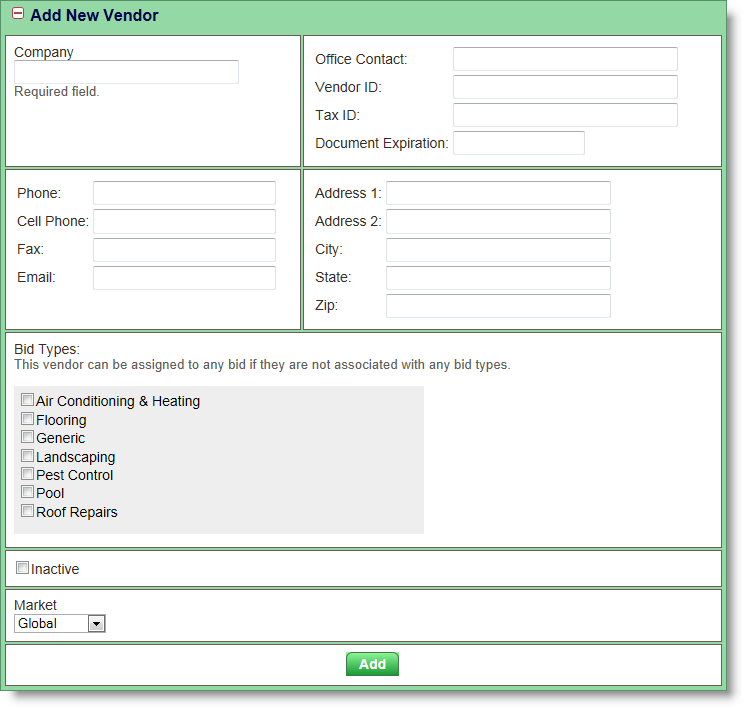 Add the vendor's main contact information in the appropriate fields. For information on adding additional contacts, see Adding Secondary Contacts below. 4. If you wish to associate this vendor with a bid type, select the appropriate check box(es) in the Bid Types section. For help on understanding bid types, see the Bid Types section of this Help document. Once a Vendor is created, the information can be updated, but the vendor cannot be deleted from the system. The populated Vendor ID field will be visible with the vendor information on bids assigned to them in Properties > Preservation. The Market drop down allows you to make a vendor available only in the specific market selected. If the Global option is chosen, the vendor will be available to properties in all markets.